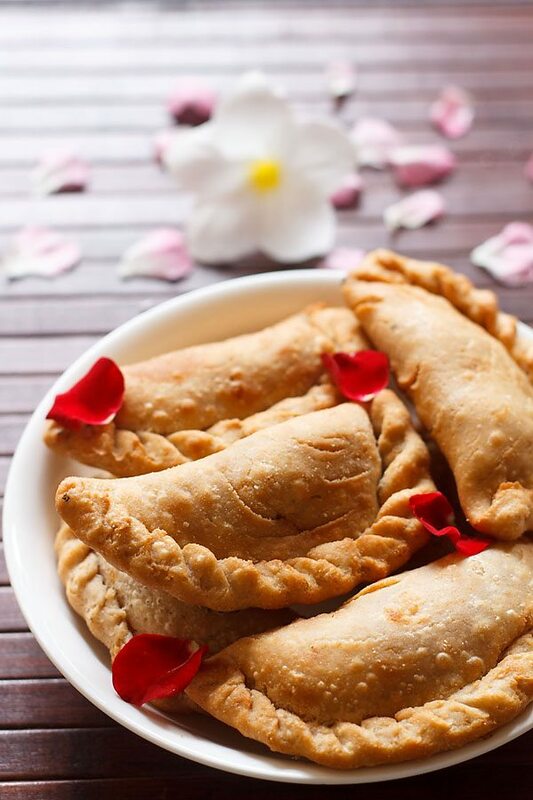 mawa karanji or dry fruits karanji are deep fried pastry made from whole wheat flour, stuffed with mawa, dry fruits, poppy seeds and desiccated coconut. 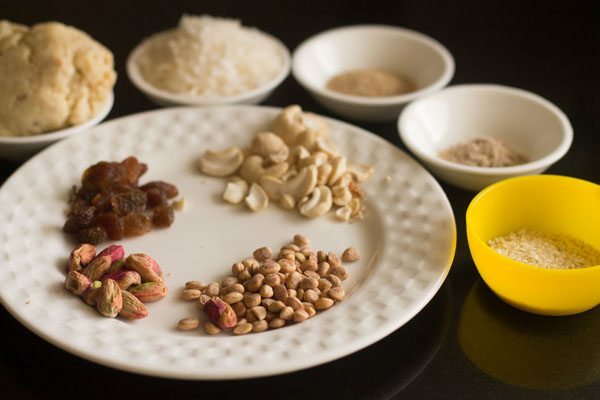 dry fruits karanji recipe with step by step photos. dry fruits karanji are deep fried pastry made from whole wheat flour & stuffed with mawa, dry fruits, poppy seeds and desiccated coconut. karanji are mostly made during festivals like holi, ganesh chaturthi and diwali. 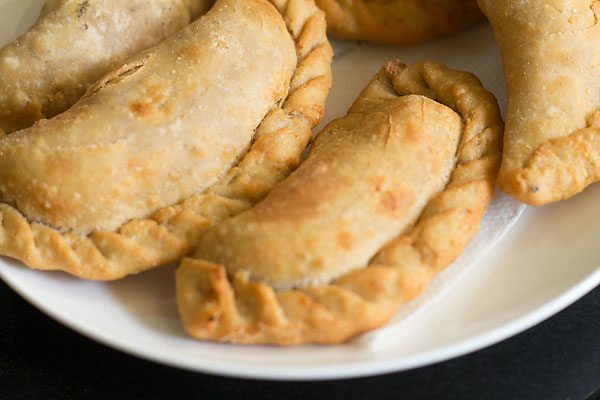 the best karanji are the ones which have a flaky, crispy exterior with a delicious filling inside. 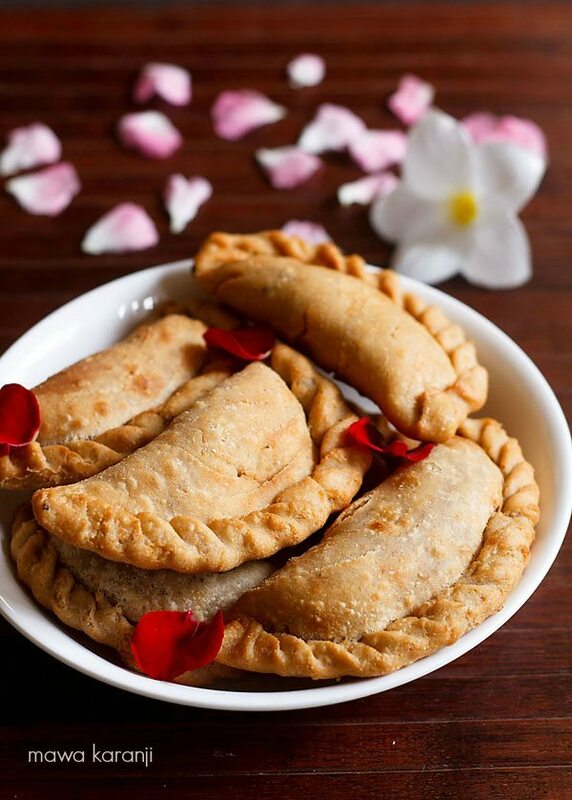 while in maharashtra, this pastries are called karanji, in north indian they are known as gujiya and in goa they are called as nevri. the method of preparation is mostly same with only the filling being different. 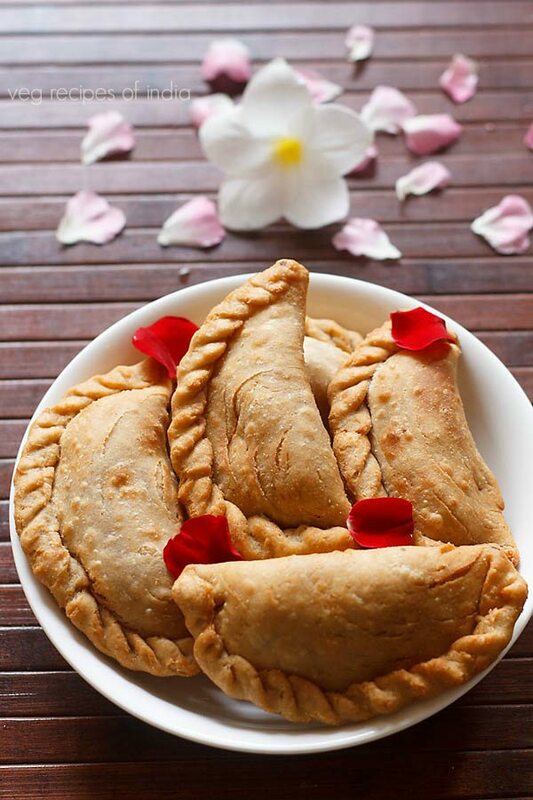 mostly karanji are made with all purpose flour. however, i have used whole wheat flour for this recipe. yet the karanji were flaky from outside. 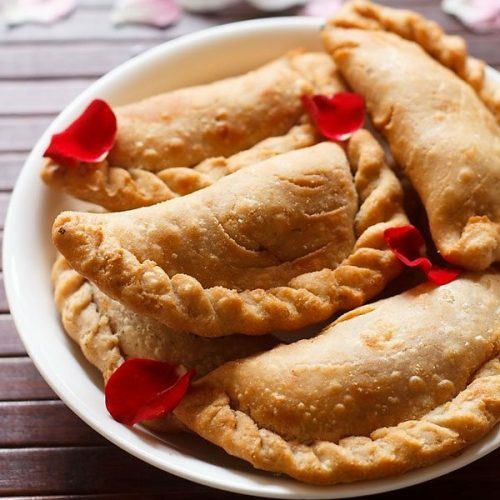 these karanji have a delicious sweet stuffing of mawa and dry fruits. this recipe comes from my mom. you can also check dry fruits barfi and dry fruits ladoo recipe. 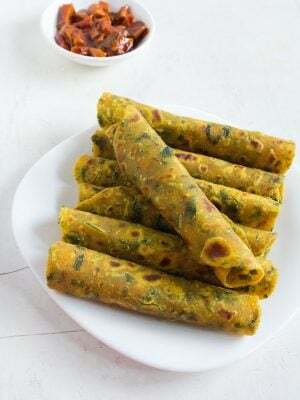 you can store these mawa karanji for 1 day at room temperature and up to a week if refrigerated. 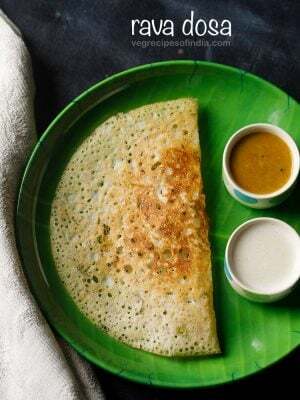 as the filling consist of mawa its better to consume at the earliest. in the recipe, i have layered the outer cover of the karanji but its optional. 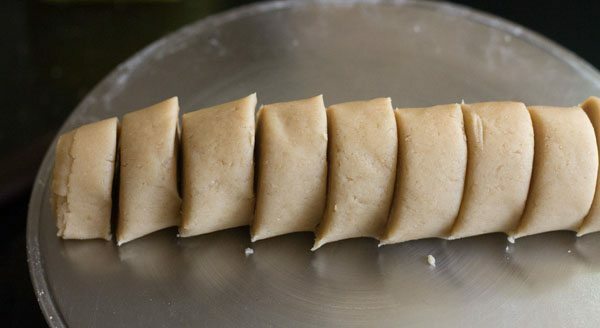 you can just roll the dough, place the filling and then prepare the karanji. 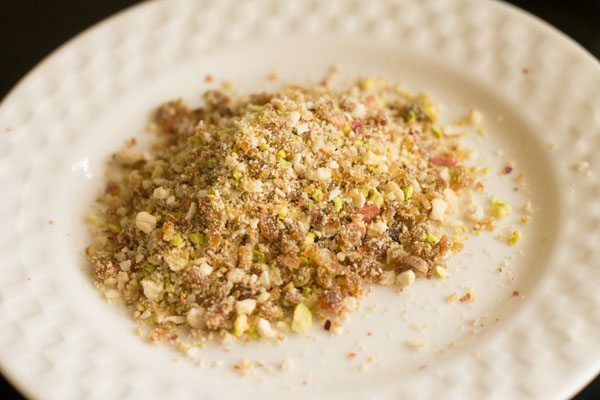 add all the dryfruits like cashews, pistachios, chironji and raisins in a grinder jar. grind them for just 5 to 6 seconds to get a coarse mixture. alternatively you could chop them very finely. heat a pan add then add 1 teaspoon of ghee. lower the flame. 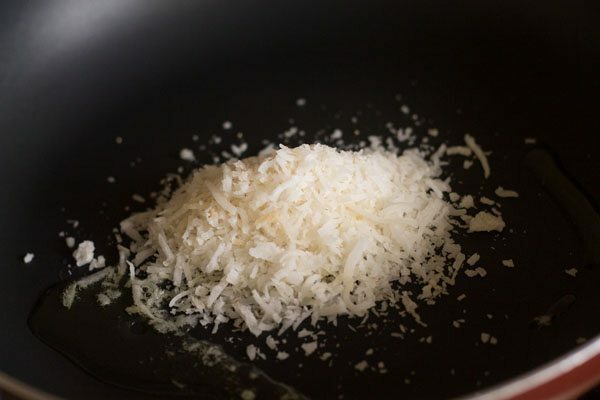 once the ghee melts, add desiccated coconut. keep stirring the coconut and roast till they become light golden. remove and place aside. in the same pan add 1 teaspoon of ghee/oil. then add sesame seeds and poppy seeds. roast for a minute on low heat for a minute or until they leave aroma. 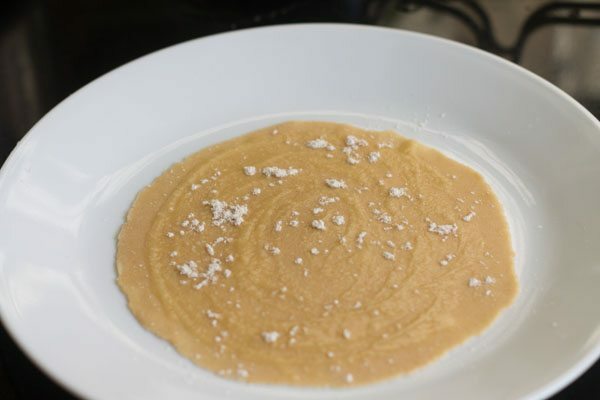 remove the roasted poppy seeds, sesame seeds and place aside with the roasted coconut. now in the same pan add grated or chopped mawa. saute the mawa for a minute on low heat and keep stirring. 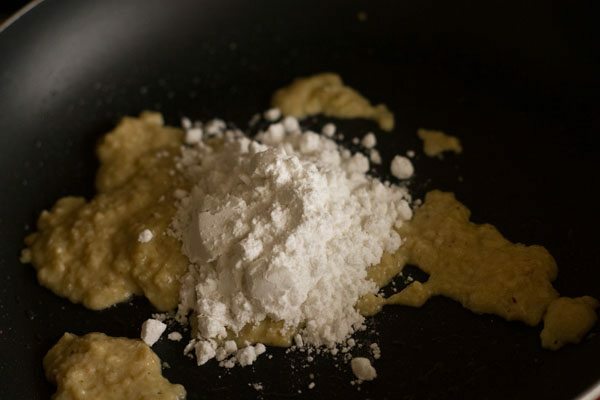 once all the mawa has melted, then add 1/4 cup of powdered sugar. stir well on low heat for a minute. ensure the mixture is smooth and free of lumps. now add the coarsely ground dry fruits. also add the roasted sesame seeds, poppy seeds, desiccated coconut. also sprinkle 1/4 teaspoon cardamom powder. keep stirring for a minute on low heat or until the mixture leaves aroma. remove the mixture and place aside. 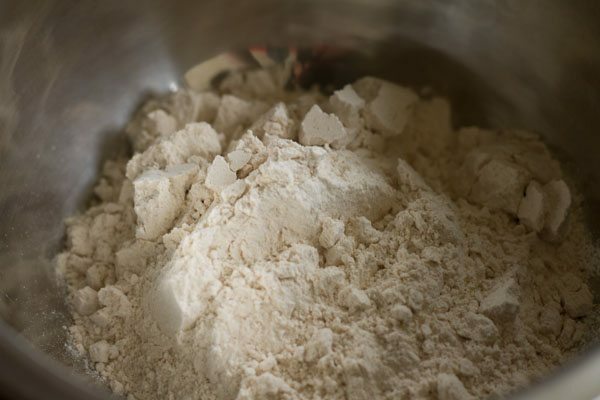 in a pan or mixing bowl, add 1 cup of whole wheat flour. then add 1 tablespoon or rice flour and 1/4 teaspoon of salt. mix all well with a spatula or your finger tips. 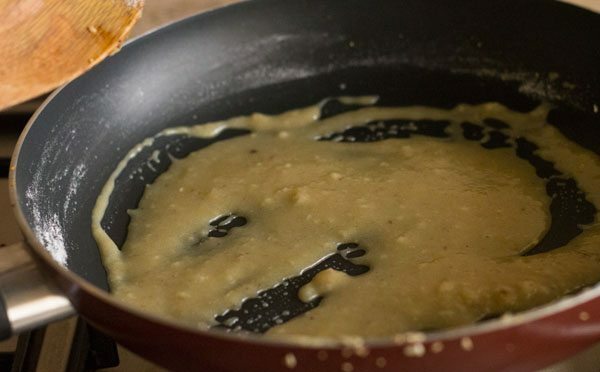 heat 1.5 tablespoon of ghee/oil in a small pan or tadka pan. 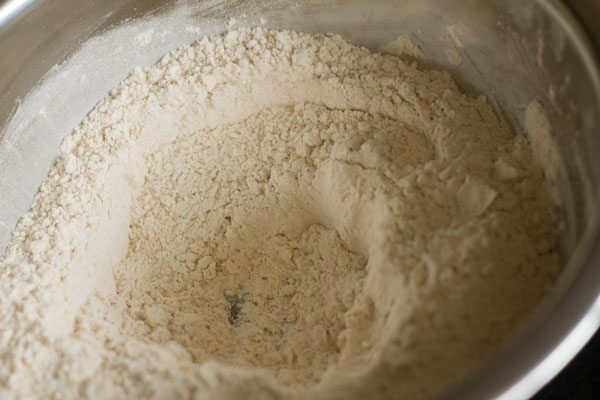 make a small depression in the flour and pour the hot ghee/oil in it. 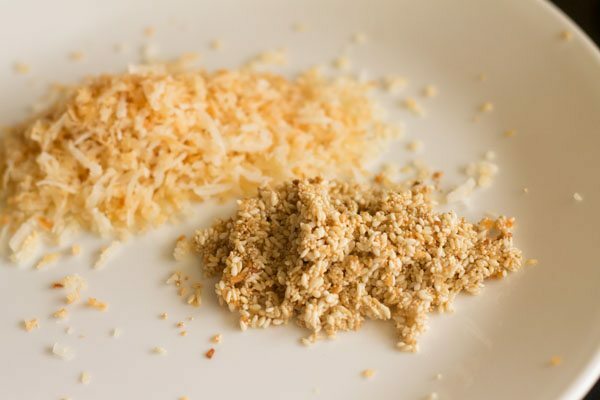 mix very well with a spatula or your fingers till you get a bread crumb consistency in the flour mixture. allow the ghee/oil to cool down if using your hands, else you might burn them. then pour 1/4 cup of water. start kneading the dough. 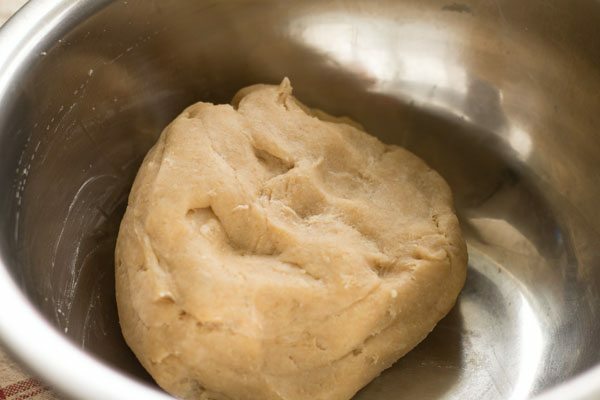 the dough should be firm and smooth just like a poori dough. ensure you don't add too much water else the dough would be soft. only if the dough appears to be dry then add few drops of water. 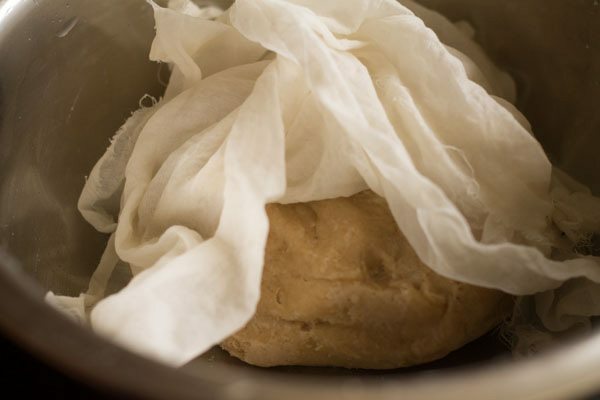 wrap the dough with a damp linen cloth and allow to rest for 10 to 12 minutes. 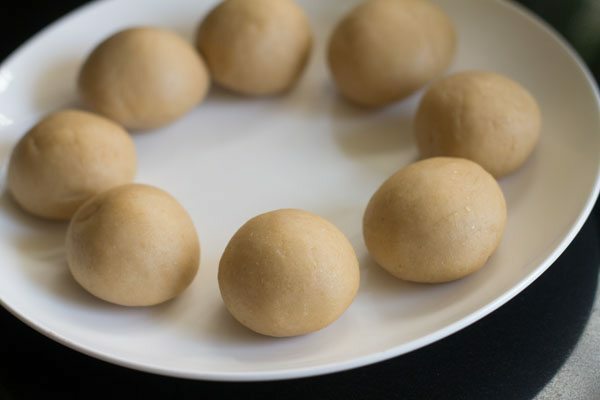 make lemon sized balls from the dough. flatten the ball and dust some flour over it. 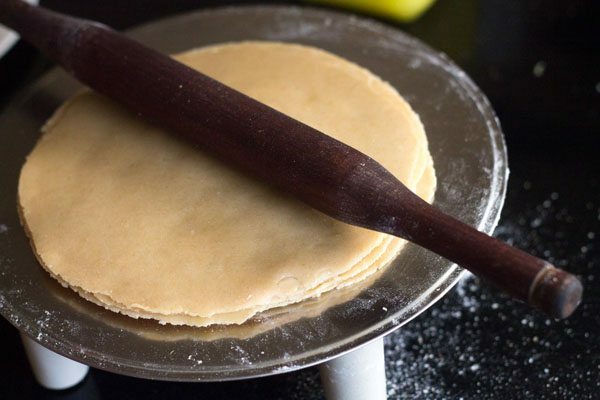 roll the dough round in 4 to 5 inches diameter circle or into thin roti. keep aside. similarly roll all the dough balls into thin rotis of almost same size and width. now take one roti. first spread some little ghee all over on it. then sprinkle some flour over it. place another roti over it. 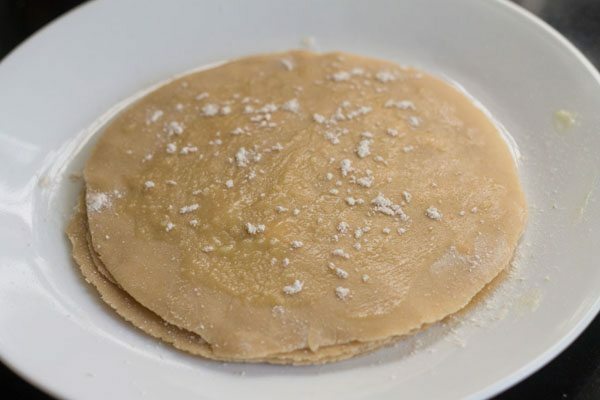 similarly spread some ghee on the second roti and sprinkle some flour over it. top with the third roti and repeat the same for rest of rotis except the last roti. then, just roll with the rolling pin gently so that they look uniform and stick nicely to each other. now gently roll the stacked rotis from one side to another side. just like how you you make a swiss roll or pinwheel cookies. ensure you seal the edges properly with your finger tips. now cut the roll in equal slices. the sliced rolls would look similar to a swiss roll. 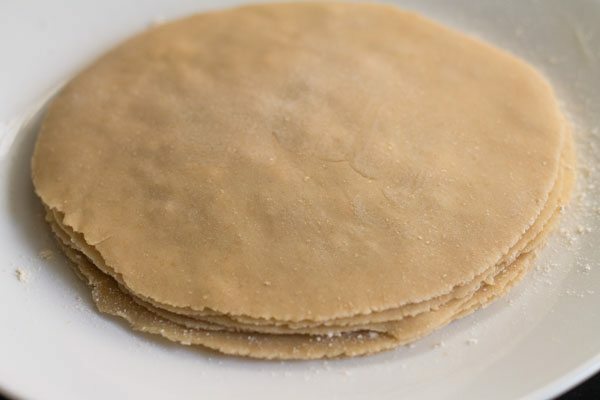 dust some flour, take each sliced roll and flatten gently with a rolling pin, gently roll the dough round in 3 to 4 inches diameter circle. similarly roll all the sliced dough and place aside. 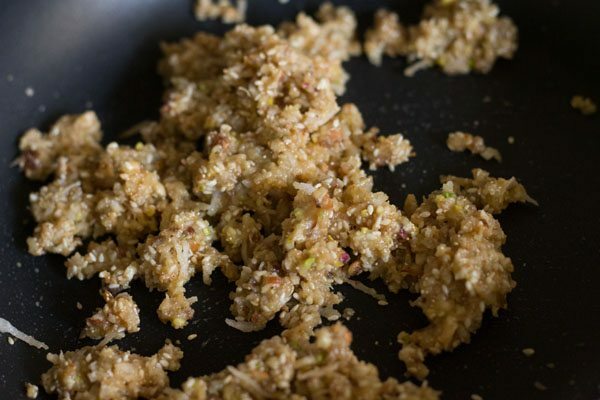 place 1 tablespoon of the stuffing in the center or on one side of the circle, keeping the edges empty. 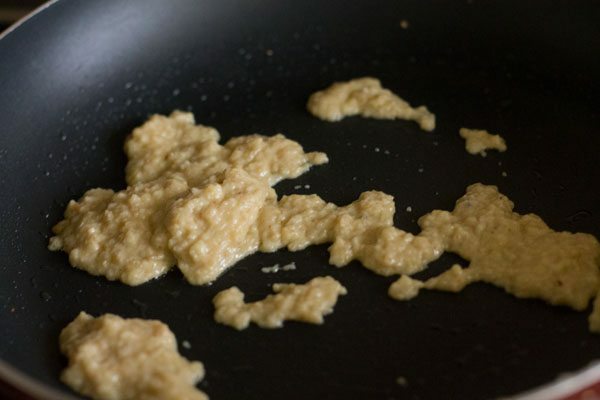 make sure you don't over stuff as they may also break while frying. with your fingertips, apply water all over the edges of the karanji. gently bring together both the edges. gently press so as the edges are sealed well. now with your fingertips, start pinching and pleating the pressed edges. keep on pleating till you come to the end. seal the end carefully with a pleat. alternatively you could use press the edges with a fork to give them design or use karanji moulds. 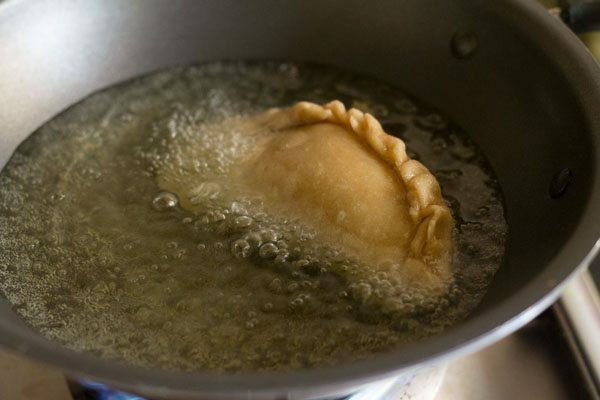 just ensure the edges are sealed properly or else they might break while frying. 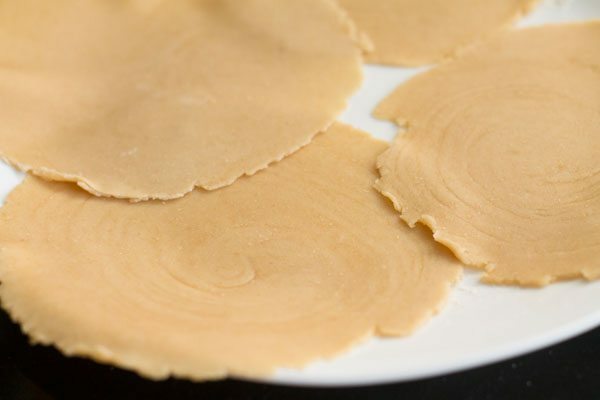 similarly prepare karanji with the rest of the sliced dough. 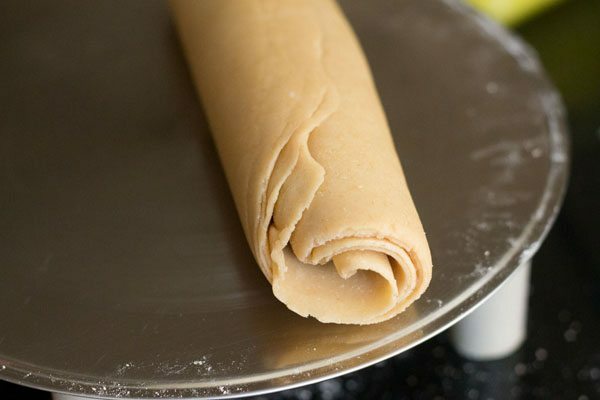 keep the prepared karanji covered with a moist kitchen towel, so that they dough does not dry out. heat oil for deep frying in a kadai or pan. add a small piece of dough to check the oil temperature. if it rises gradually then your karanji are ready to fry. fry 1 to 2 karanjis at a time. fry till they are golden brown and crisp. similarly fry the rest of karanji and place them on kitchen towel/napkins to absorb excess oil. allow them to come to room temperature.then store the karanji into an air-tight container. mawa karanji should last for a week if refrigerated. 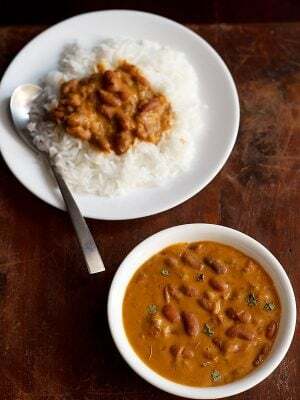 serve the mawa karanji at room temperature. 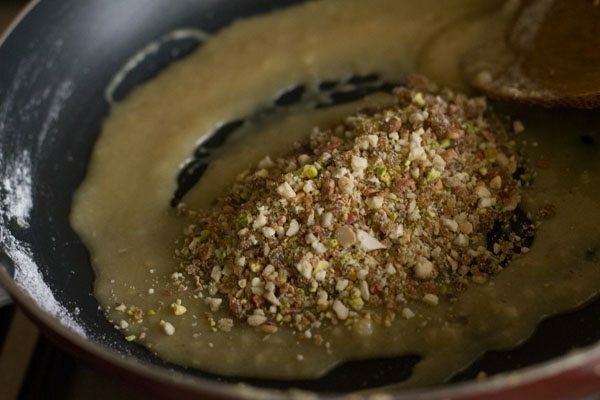 2. add 14 to 15 cashews, 1 tablespoon pistachios, 1 tablespoon chironji and 1 tablespoon golden raisins in a grinder jar. 3. just grind them or pulse them for only 5 -6 seconds till you get a coarse mixture. alternatively you could chop the dry fruits very finely. 4. heat a pan and add 1 teaspoon of ghee. lower the flame. 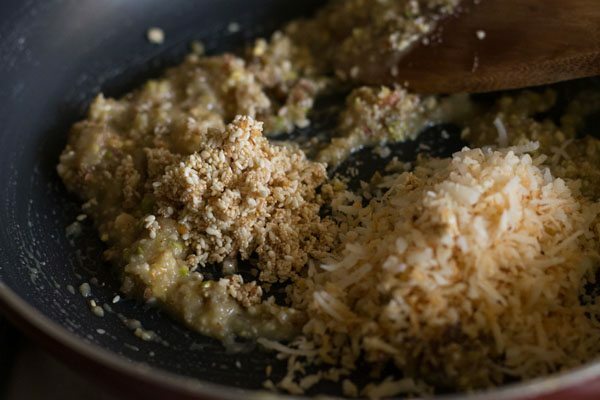 once the ghee melts, add 4 teaspoons desiccated coconut and roast it. 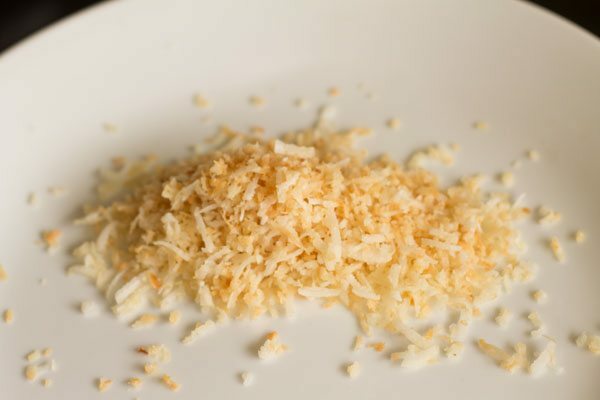 5. keep stirring the coconut and roast for 2 mins or until its color changes to a light brown. 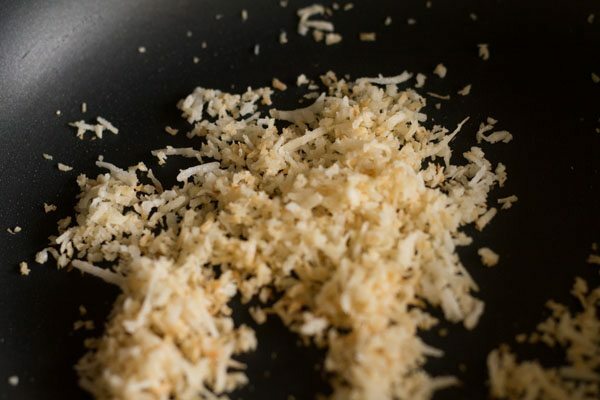 6. remove the roasted desiccated coconut and place aside. 7. in the same pan, add 1 teaspoon of ghee. then add 1 tablespoon sesame seeds and 1.5 teaspoons poppy seeds. 8. saute for a minute on a low flame or till the seeds become aromatic. 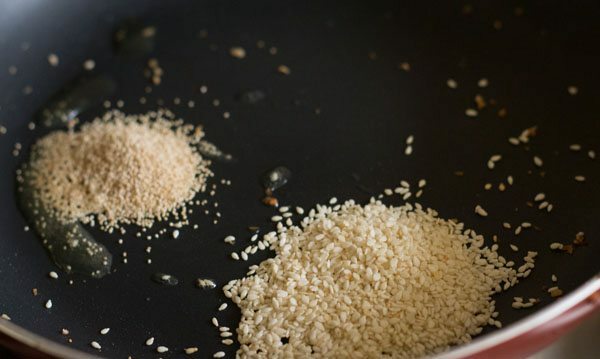 9. remove the roasted poppy seeds and sesame seeds. place aside with the coconut. 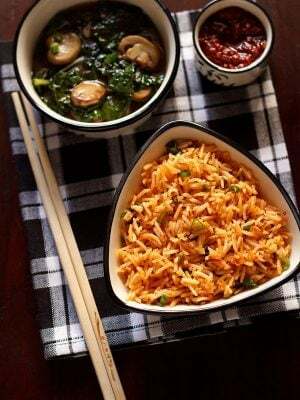 10. in the same pan add grated or chopped mawa. 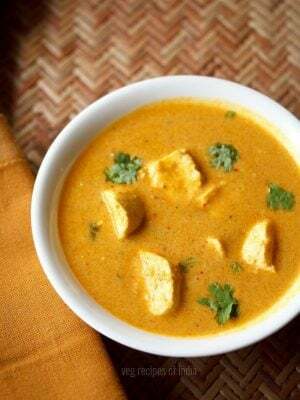 11. fry the mawa for a minute on a low heat and keep stirring. the mawa would begin to melt. 12. then ¼ cup powdered sugar. 13. stir well on low heat for a minute. 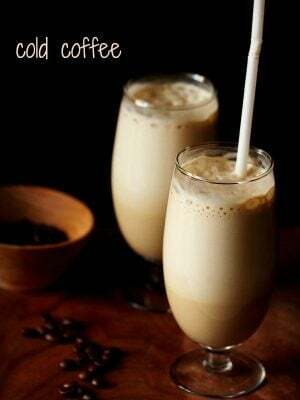 ensure the mixture is smooth and free of lumps. 14. now add the ground dry fruits. 15. also add the sesame seeds, poppy seeds, desiccated coconut. also sprinkle ¼ teaspoon of cardamom powder. 16. keep stirring for a minute on a low heat or until the mixture leaves aroma. remove the mixture and place aside. 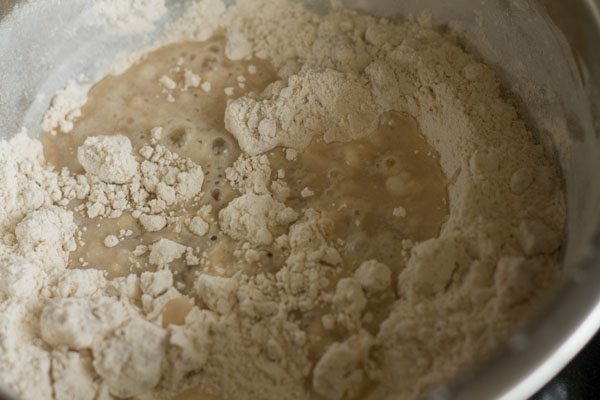 17. in a pan or mixing bowl, add 1 cup of whole wheat flour. 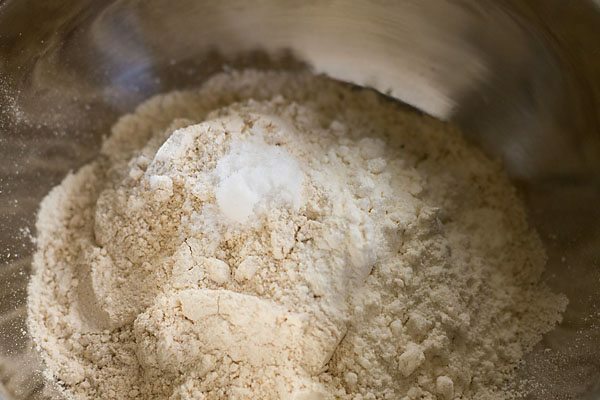 18. then add 1 tablespoon of rice flour and ¼ teaspoon of salt. 19. mix well with a spatula or with your finger tips. 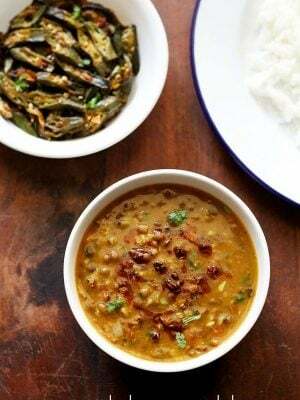 20. heat 1.5 tablespoon of ghee/oil in a small pan or tadka pan. 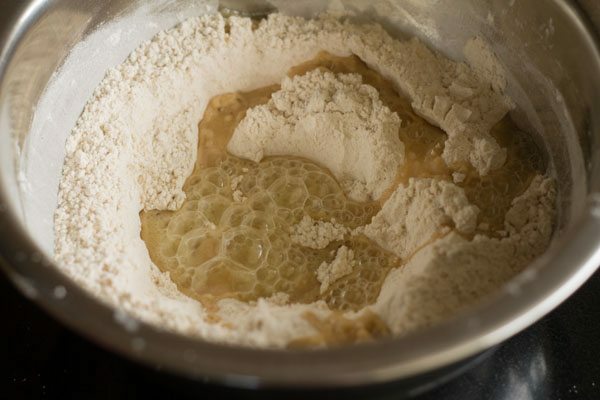 21. make a small depression in the flour and pour the hot ghee/oil. 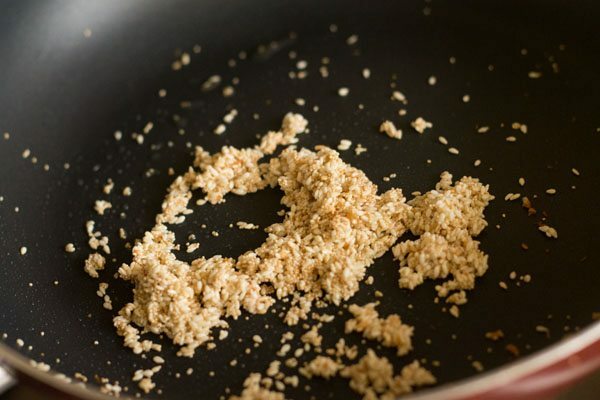 22. mix very well with spatula or finger tips till you get a bread crumb like consistency. 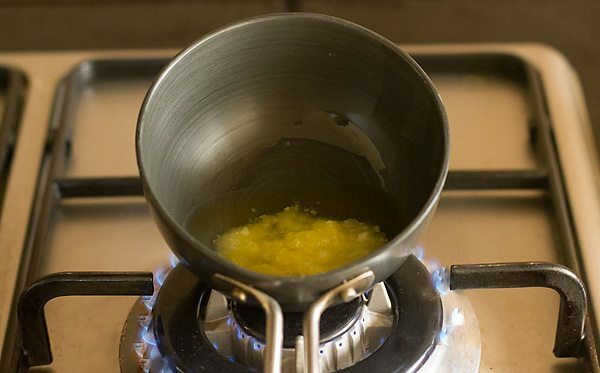 just allow the ghee/oil to cool if using your fingers, else you might burn them. 23. pour ¼ cup water. 24. start kneading the dough. 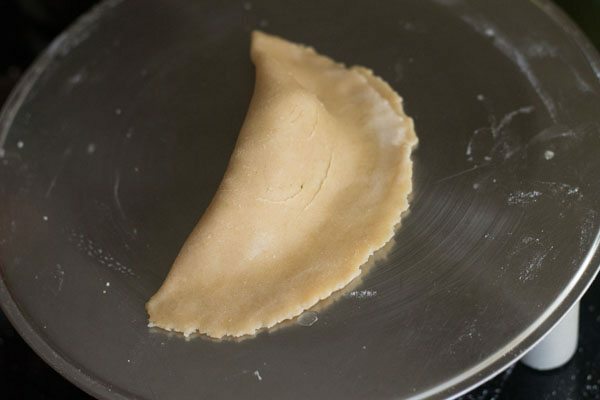 25. the dough should be firm and smooth just like a poori dough. ensure you don’t add too much water else the dough would be soft. 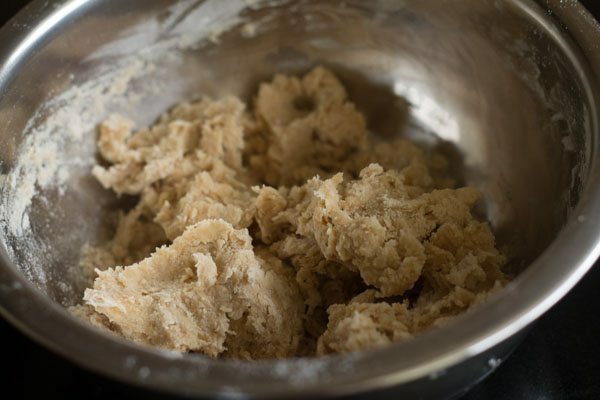 only if the dough appears to be dry, then add few drops of water. 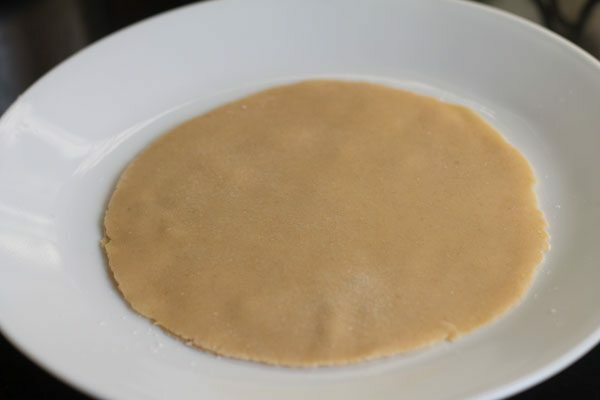 26. wrap the dough with a damp linen cloth and allow to rest for 10 to 12 minutes. 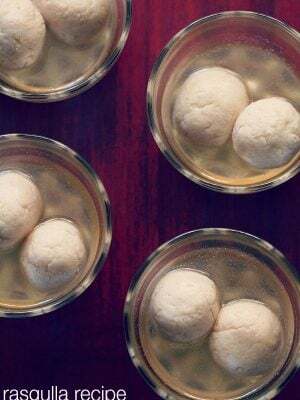 27. make lemon sized balls from the dough. i got around 8 balls from the dough. 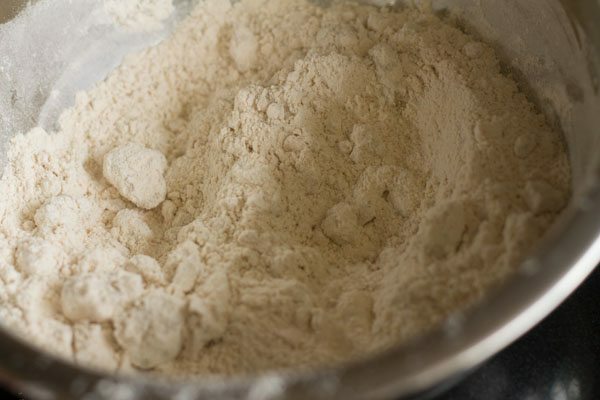 28. flatten the ball and dust some flour over it. 29. roll the dough round in 4 to 5 inches diameter circle. the dough has to be rolled thin. 30. place the rolled dough aside. similarly, roll all the balls into thin circle of almost same size and width. 31. spread some little ghee all over on one rolled dough circle. sprinkle some flour over it. 32. place a second dough circle over the first one. 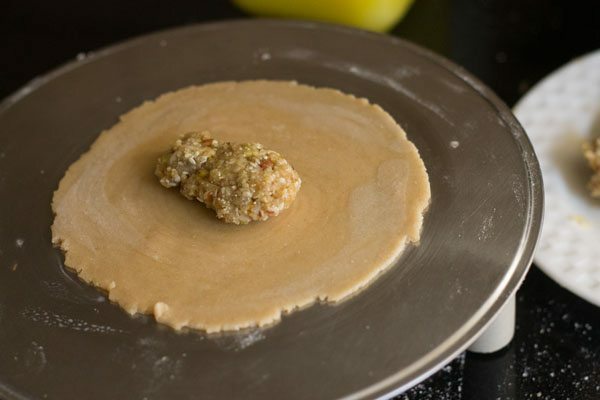 33. similarly spread some ghee on the second dough circle and sprinkle some flour over it. 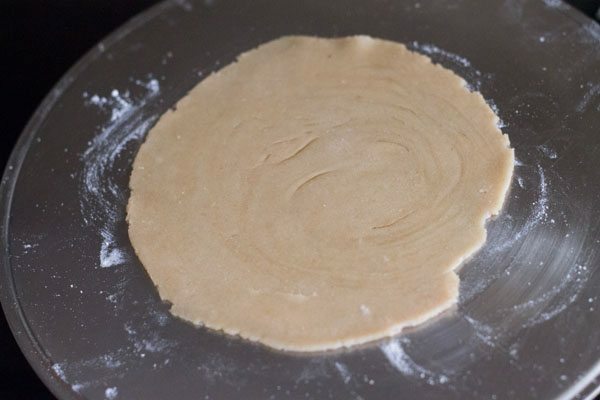 34. top with the third dough circle and repeat the same for rest of rolled dough circles, except the last one. 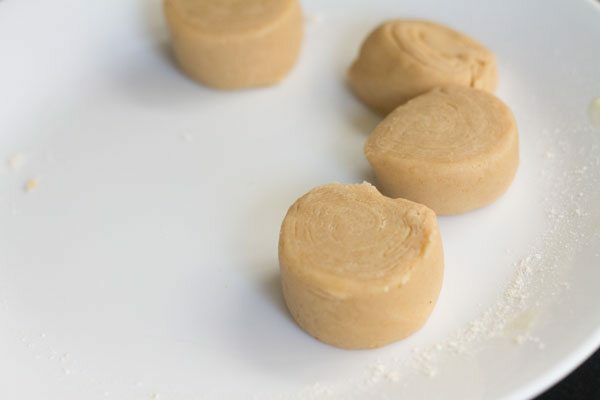 35. now, roll with a rolling pin, gently so that they look uniform and stick nicely to each other. 36. gently roll the stacked circles from one side to another side. just like how you you make a swiss roll or pinwheel cookies. ensure you seal the edges properly with your finger tips. 37. now cut the roll in equal slices. 38. the sliced rolls would look quite similar to a swiss roll. 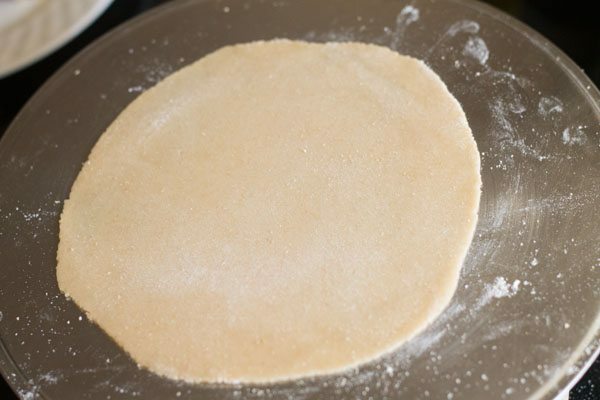 39. dust some flour, take each sliced roll and flatten gently with a rolling pin. 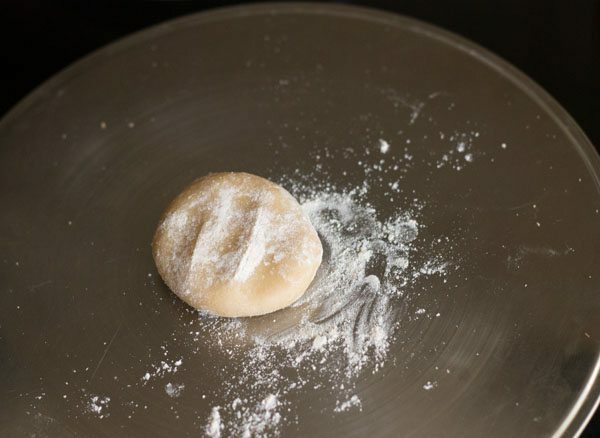 roll the dough gently round in 3 to 4 inches diameter circle. 40. similarly roll all the sliced dough and place aside. 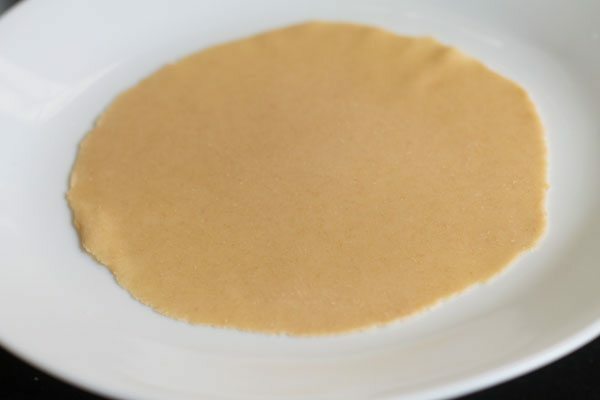 41. place 1 tablespoon of the stuffing in the center or on one side of the circle, keeping the edges empty. 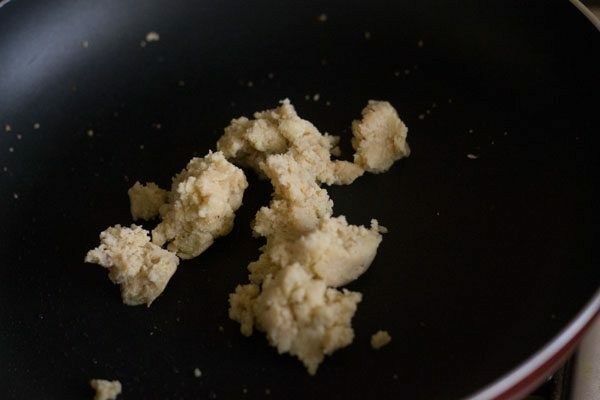 make sure you don’t over stuff as they may also break while frying. with your fingertips, apply water all over the edges of the karanji. 42. gently bring together both the edges. gently press so as the edges are sealed well. 43. now with your fingertips, start pinching and pleating the pressed edges. keep on pleating till you come to the end. seal the end carefully with a pleat. alternatively you could use press the edges with a fork to give them design or use karanji moulds. just ensure the edges are sealed properly else they might break while frying. 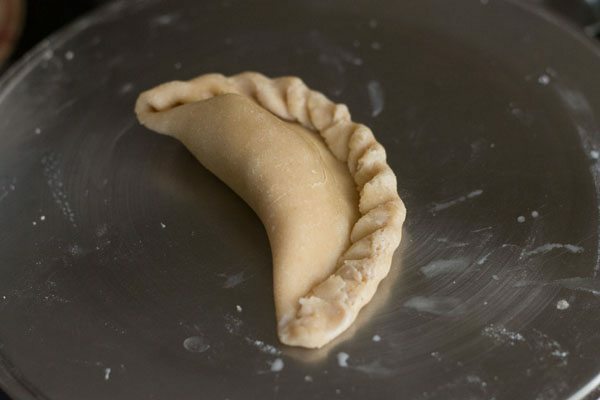 44. similarly make karanji with the rest of the sliced dough. keep the prepared karanji covered with a moist kitchen towel, so that they do not dry out. heat oil for deep frying in a kadai or a deep pan. 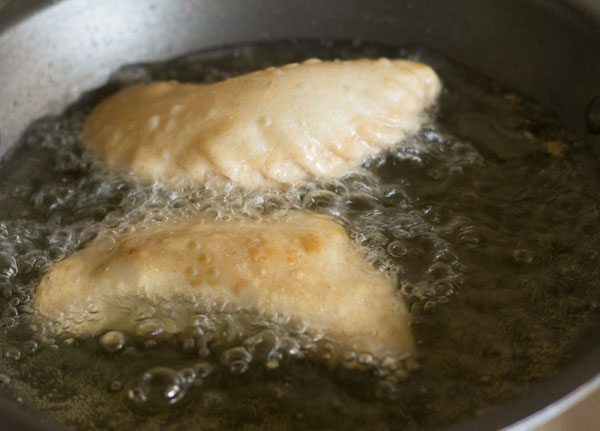 to check the frying temperature, just add a small tiny piece of dough. if it rises gradually then the karanjis are ready to fry. fry 1 to 2 karanjis at a time. 45. fry until they are golden brown and crisp. 46. similarly fry rest of karanji and place them on kitchen towel/napkins to absorb excess oil. then allow them to come to room temperature. 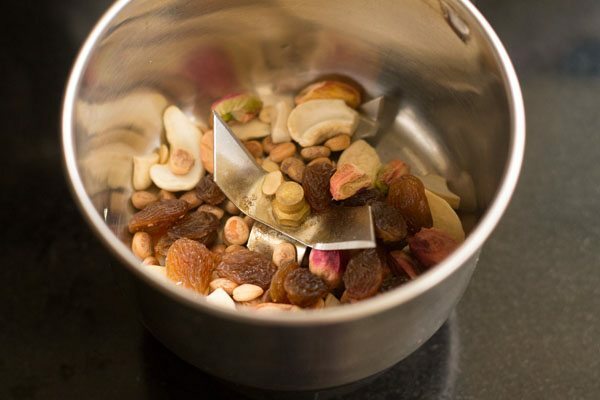 later store the dry fruits karanji in an air-tight container. these dry fruits karanji should last for a week if refrigerated. serve the karanji at room temperature. sure ritu let us know how the karanji was? thanks for positive views. harini, you can use jaggery.